Life's a Beach | Expat Life in Playa del Carmen : Blog Action Day - A Real Estate Throwdown on Ambergris Caye!!! After thinking long and hard about poverty, the subject of Blog Action Day 2008, I find myself with more questions than answers. First and foremost is "What IS poverty?" and secondly "Who makes that determination?” Can we categorize poverty solely in economic terms? It certainly seems that our American politicians, on both sides of the fence, liberally pander to our populace living in so-called poverty in their efforts to curry favor and win votes. It would seem that they would certainly have a vested interest in where and how that poverty threshold is set. Currently, in the United States, anyone under the age of 65 with an income under $10,787.00 is said to be living below the poverty line. A family of four must have a combined income of under $21,027.00 to claim the title. These numbers are adjusted annually for inflation and in short determined by finding the total cost for the essentials a human needs to live a "tolerable life". As every country in the world has their own unique standard of living. Each has their own poverty line, their own pandering politicians and their own methods to determine where that line is drawn. But is this really how the rest of us should look at poverty? Is economics the only factor to be considered? Does total household income tell the whole story? Surely, there are other factors to be considered if we, the people, are to play a part in combating the causes and effects of poverty. As a member if the real estate and development industry I often feel conflicted about our connection with poverty. In that, I mean that I clearly see that although growth and development brings jobs and money spending consumers to a region, these geographic areas of are rarely those where help is most needed. Beach towns that become hot-spots for tourism can rarely support the explosive growth that comes with the interest of foreign investment. People flock to these coastal areas from all over Mexico to fill the hundreds of thousands of jobs created by the mega resorts and condominium developers. So far, along the Riviera Maya, it seems that our "demand" for laborers is keeping pace with the "supply" of migrant workers. There is little or no unemployment here. The working class may appear poor by our American standards but they are keeping roofs over their heads, clean clothes on their backs and food on the table. They enjoy the conveniences of a stable source of water, proper sewage and garbage removal, safe public schools to educate their children and police protection; the essentials one needs to live a "tolerable life". However, this is not the case everywhere. Sometimes, the outside perception of a region's growth is askew. Sometimes, due to economic shifts and even normal market fluctuation, investment in seemingly popular areas tapers off. What happens when the "supply" of workers far exceeds the "demand"? 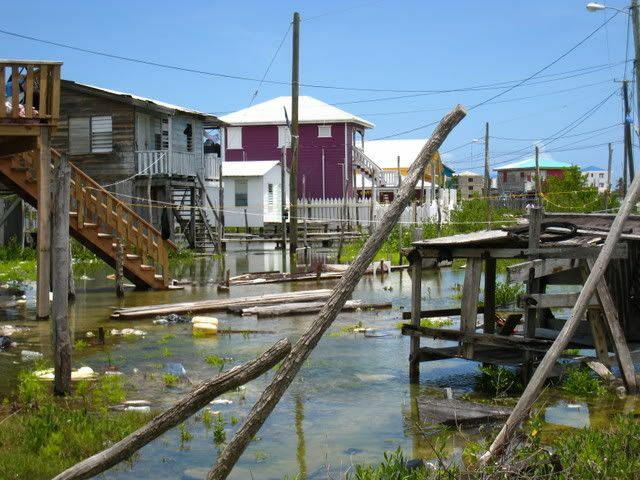 Such is the case on Ambergris Caye, a small island off the coast of Belize. 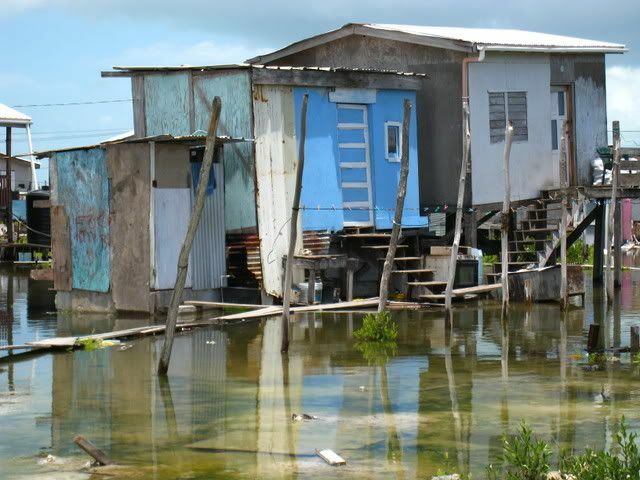 With its currency tied 2 to 1 to the American dollar, Belize feels every bit of the economic crisis in the United States. 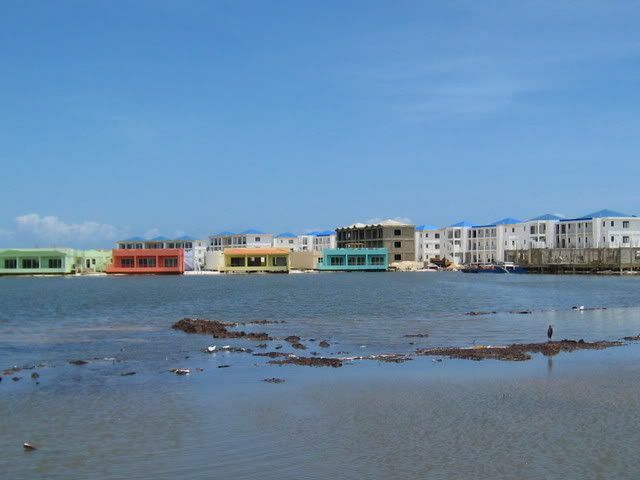 With much of the island's investment money coming from the US, it doesn't take an analyst to figure out what the market conditions have done to the rates of development and building on Ambergris. Ambergris is still growing, just not fast enough to keep up with the migration of hopeful souls who travel from the interior of Belize, Guatemala and even Mexico in search of a better life. They arrive, often having spent their last penny, only to find that the “Promised Land” is not exactly what they expected. Jobs are hard to come by, housing costs are astronomical and there is insufficient infrastructure in place to support all these families. In a half hearted effort to accommodate the working and non-working poor on Ambergris, an area on the island, just north of the tourist “Mecca” San Pedro, was "given" to these families on which to build their homes. In all fairness, they were told in no uncertain terms that no services would be provided to this "neighborhood". No water, no sewer, no garbage collection...nothing. They simply were being provided with a place to build shelter and live. Nothing more. And so it is. Years later San Mateo is exactly as you would expect: a filthy, unsanitary blot on an island that demands and collects top dollars from tourists from all over the globe. Sandwiched between the desirable town of San Pedro and upscale villas and condominium complexes to the north, one can only wonder how long the residents will be "allowed" to inhabit this area. Already it seems, the powers that be are conspiring against the residents of San Mateo. Efforts to bring in clean fill to combat the almost constant flooding in the area have been blocked. Rumor has it that certain developers have lined the pockets of local politicians and service providers, thwarting the attempts of caring, local citizens to clean up San Mateo and create safe and sanitary living conditions for these families. The recent death of a young child, presumably due to the festering, disease infested water around her home sounded an alarm and elicited a public out-cry for governmental help and funds to ameliorate the deplorable conditions in this neighborhood. Months later, nothing has been done and everyone seems to have slipped back into complacency. Still, there is no source of clean water, so sewer system, no garbage removal service; nothing to sustain a "tolerable life". The wheels of change move slowly on this island. The following pictures can tell the story better than my words. I took these photographs a few months ago while visiting the Holy Cross Anglican School. My friend Laurie chastened me a bit as I was framing up my shots, reminding me that the families of San Pedro were poor but not without pride. She asked me to consider that they might be embarrassed to have their living conditions plastered on the world wide web for all to see and, presumably, judge. So, until now, I have refrained from doing so. I do think, however, that this is an appropriate format and so I post them, not to exploit but with repect, to hopefully raise awareness. I have a strong suspicion that a vast majority of the visitors to Ambergris never venture outside of San Pedro and have never met their northern neighbors in San Mateo. I'm going to change that today. THIS IS MY BLOG ACTION. I admittedly, do not know the whole story. I know that there are behind the scenes details and history that I am not privy too. I may not "have all my facts straight". Here is what I CAN say without a shadow of a doubt. PEOPLE LIKE TO FEEL WARM AND FUZZY ABOUT THIER INVESTMENT CHOICES. What do I mean by this you might ask? I'll make it simple. John and Jane America visit San Pedro and fall in love with the island lifestyle. They dream of owning their own little piece of paradise and begin the process of investigating real estate options on the island. While doing their homework on the internet, as almost everyone does in this day and age, they find many websites, articles and BLOGS about life and real estate on Ambergris Caye. 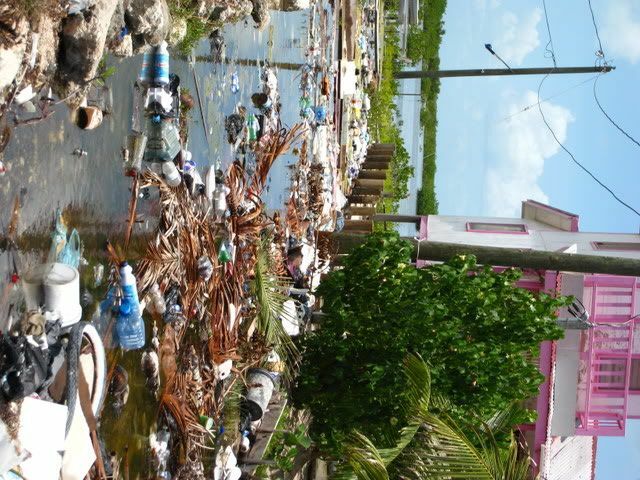 Some of these articles will belabor the evils that seem to plague to our industry: disregard for the environment, suspect business practices etc... Others will talk about certain concerned citizens who have given back to the island they love; investors, builders, developers who have made a difference in the lives of the residents of Ambergris Caye. Who do you think John and Jane America are going to buy from? The philanthropic developer who donates his time and money to make life better for his less fortunate neighbors or the guy who gives gold watches to the owners of the island's service providers in order to buy their loyalty and restrict their operations. 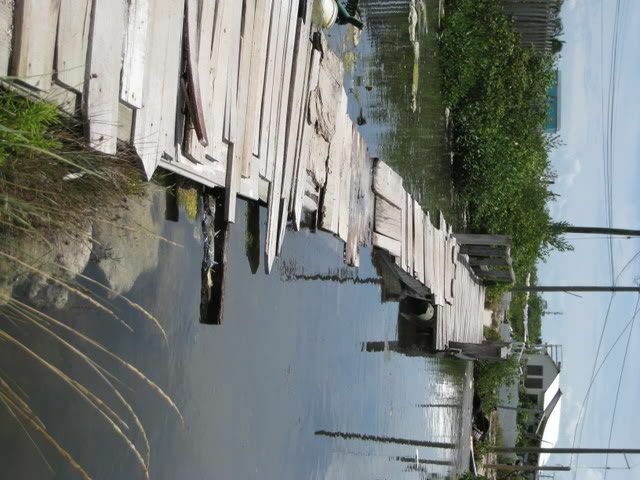 And so, investors and developers on Ambergris Caye I throw out down the gauntlet. This is a Real Estate Throwdown! Use your influence; use your contacts, your resources and your money to fix San Mateo. I'm in the business. I KNOW how much money you're making. Answer my challenge I will do everything in my power to make sure that I use every weapon in my online arsenal to make sure your efforts are recognized and publicized. Use your powers for good and I will do the same. We bloggers have the World Wide Web in our pocket. Laurie, Collette, Cindy, Sharon...they've all got my back on this issue and we are a powerful pack of women with a remarkable web presence!! What do you want our web to say about you? 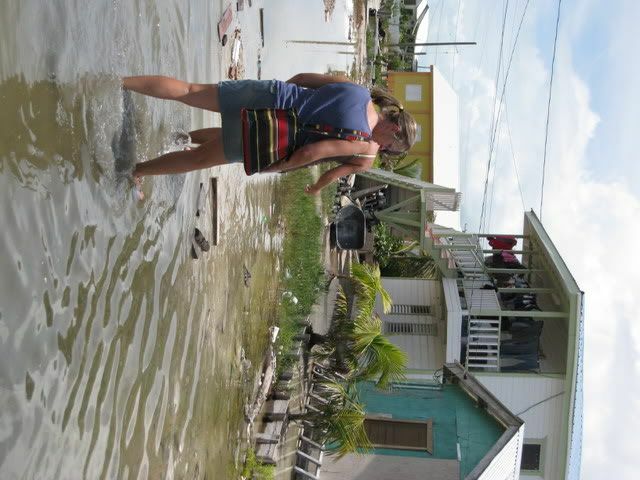 # re: Blog Action Day - A Real Estate Throwdown on Ambergris Caye!!! WONDERFUL blog entry, Michele, and what a wonderful challenge to throw out to others in the real estate business. We've been to Ambergis Caye but didn't know that San Mateo even existed. Please keep us all updated on any progress made from your efforts. Now we're going to go and work on our own blog entry for today! Gave me chills! Excellent entry. A Real estate Throwdown - I love it - great post. This reminds me of New Orleans...post-Katrina. Nothing will happen until people bring attention to the matter and DEMAND that something is done about it. The people in the community might not want to be embarassed by their condition being broadcast over the web, b ut I think it more likely that they would enjoy a clean community. Thank you everyone for the kind comments. Please take a moment and watch this short video!! # Giving Thanks. Giving Back. Thursday, April 09, 2009 1:03 PM by Viagra stories. 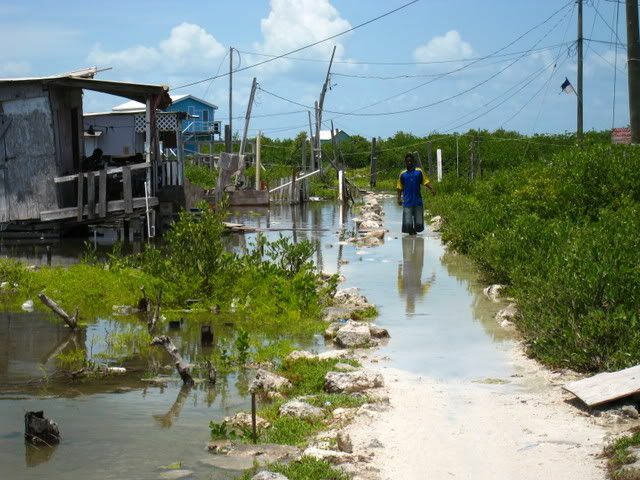 # Wastewater Garden Specialist Needed in Belize!